How do polish a floor when your concrete is like this? Deep cracks and surface spalling can make polishing jobs costly and difficult. A lot of the top surface has to be removed to get to a smooth finish. Roadware 10 Minute Concrete Mender™ is a great choice for filling out all the cracks, spalls and holes before polishing. 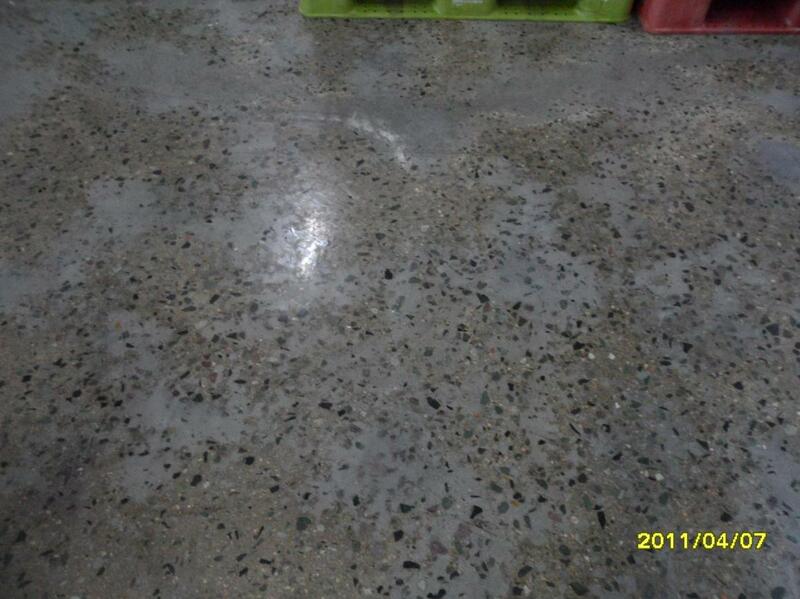 This floor was repaired by troweling down a thin layer of Concrete Mender and sand, then ground smooth. A liquid hardener completed the restoration and the floor was polished. The floor shows zero failure shown here 3 years later in 2007. The floor continues to perform today. 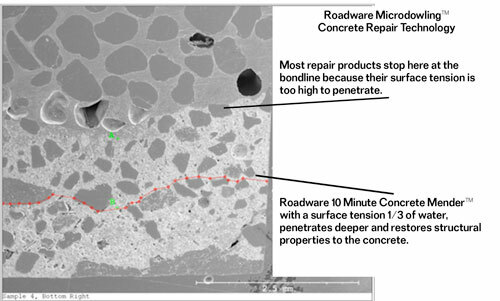 New bulk packaging for Roadware 10 Minute Concrete Mender™. 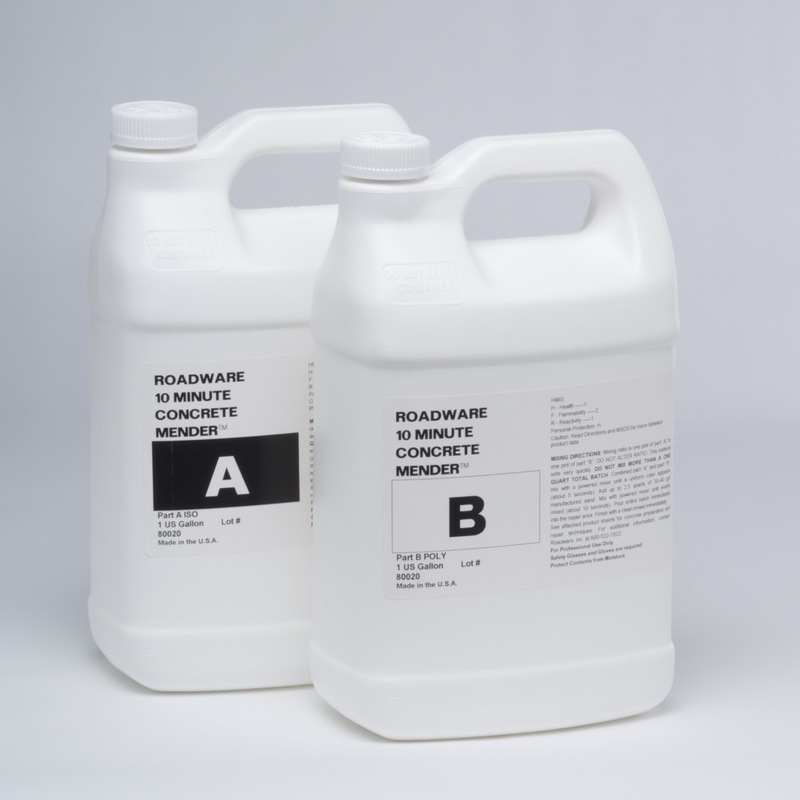 Two-gallon Roadware 10 Minute Concrete Mender™ bulk kits will now come in high-performance plastic jugs. The plastic jugs are made from the same material as our plastic cartridges. The new jugs will be boxed and sold as two-gallon kits. The four-gallon kit will be phased out. The new jugs allow for easier pouring and will accommodate a wide variety of spouts and spigots. Ten gallon bulk kits will remain in steel tight-head cans. Item 80020 Roadware 10 Minute Concrete Mender two gallon kit in high-performance plastic packaging. 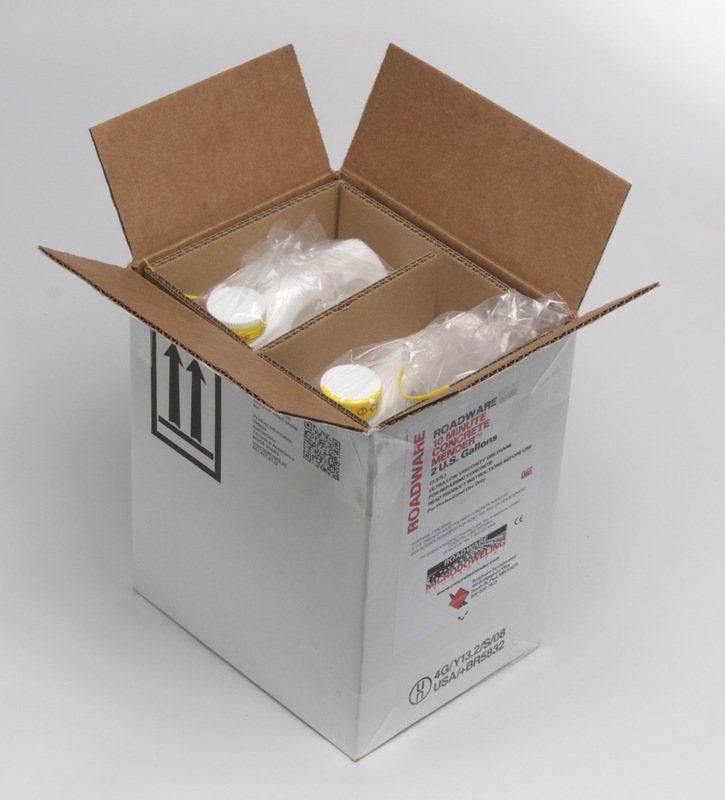 Roadware 80020 two-gallon kits are shipped in custom designed 4-G shipper cartons to insure problem free delivery. 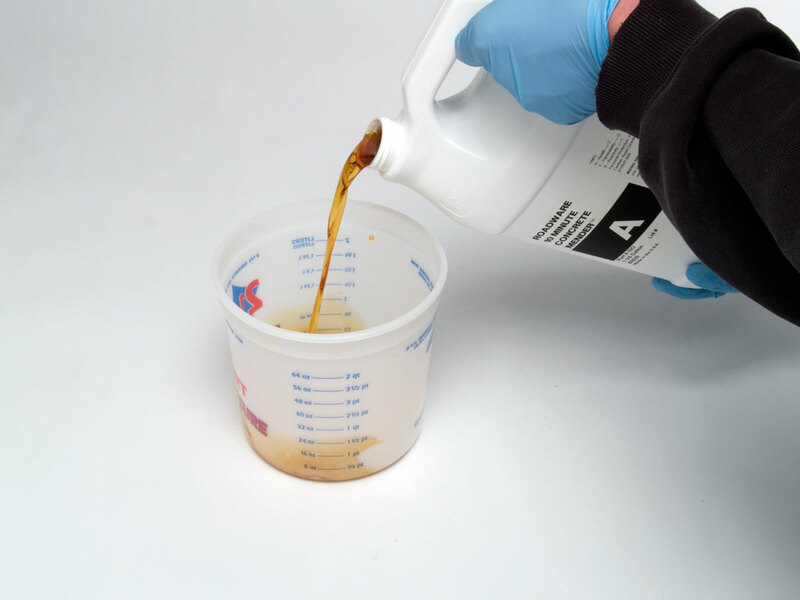 For several years, contractors in the field have been asking for a bulk container that is easier to pour from. 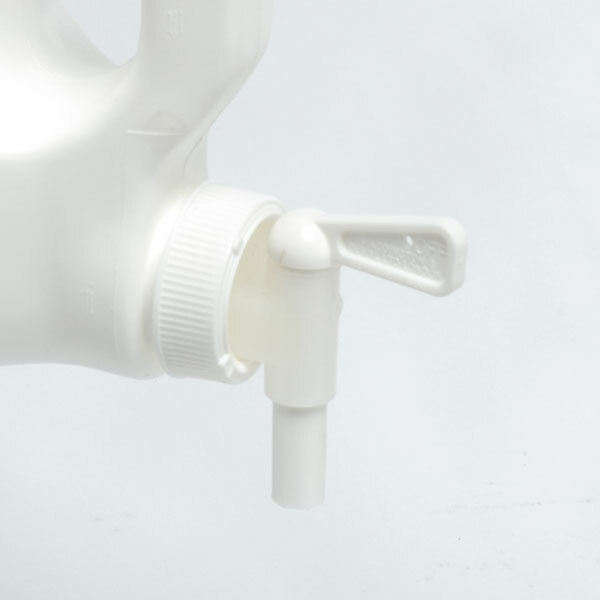 The new plastic containers use a standard size and thread and will accept a wide range of spigots and pour spouts. Screw-on spigots and spouts are available for precise measuring and pouring. The new containers and easier to pour for more precise measuring.